Our food system is a major contributor to greenhouse gas emissions, but is also highly vulnerable to climate change. All in all, our food and farming is estimated to account for almost 1/3 of the UK’s climate footprint; and in Scotland agriculture alone is responsible for 1/4 of our emissions. However, both through our food choices and how we produce our food, there is considerable scope for reducing our environmental footprint. 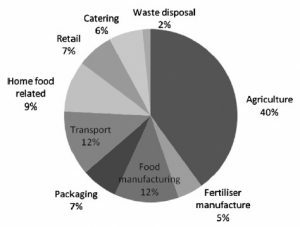 The graph besides presents an estimation of how emissions are distributed across the food supply chain. What can we do as individuals and communities? Our individual action can make a big difference. As consumers, we can reduce the emissions and wider environmental costs related to our food by eating more local and seasonal ingredients, choosing organic food where possible, and reducing our meat consumption but choosing high-welfare, Scottish livestock. Growing our own food, reducing and recycling food waste, and limiting car journeys to go shopping are all actions that also make a difference. To scale up those individual actions, we can come together as communities to develop local solutions, for example by growing food together, exchanging food before it goes off to cut waste, or making collective orders from local producers. What can we ask from our decision-makers? While some farmers are already doing fantastic work to cut their emissions and sequester more carbon in soils and trees, many are not doing as much as they could. Leadership is needed from our Government to disseminate best practice and help all farmers cut their emissions and adapt to the effects of climate change. Key priorities should include reducing artificial fertiliser use, as excessive use is currently a major cause of pollution and emissions, boosting the organic farming sector, and promoting agroforestry. Our land holds part of the solution to climate change: soils, plants, and trees can absorb and sequester huge quantities of CO2, when well-managed. Since farmers manage 75% of Scotland’s land, they have a key role to play in delivering these land-based solutions, with the right advice and incentives from Government. The Scottish Government already has an ambitious target – a 33% reduction in food waste going to landfill by 2025 – but is not currently implementing enough ambitious measures to meet that target. Much more should be done to prevent avoidable food waste through awareness raising, improved labelling, and smart regulation. And at the end of the day, all remaining food waste should be processed adequately, with a 0% landfill rate. In complex, globalised supply chains, significant energy goes into the transport, refrigeration, and storage of food. We also import huge quantities of cereals, oilseeds, and soya from abroad to feed our livestock, causing big environmental impacts abroad from deforestation, soil erosion, and unsustainable water usage. We need policy action to reduce our reliance on unsustainable imports and increase fairness in supply chains. Governments should engage with the public about the sustainability of our food consumption patterns, and lead by example in public kitchens. Vegan options should be available in all publicly funded catering, vegetarian and plant-based foods should be front and centre, and where animal proteins (or seafood) is included, it should stem from certified high-welfare production systems.